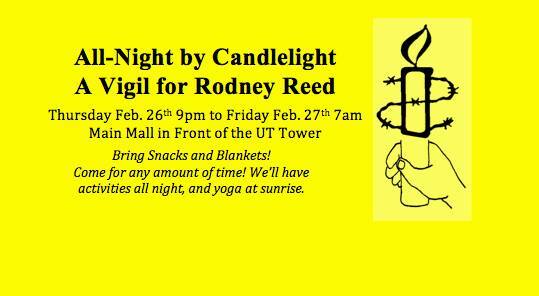 All-Night by Candlelight: University of Texas students hold a vigil for Rodney Reed | Free Rodney Reed! February 25, Austin, Texas: Members of the UT Student Coordinating Committee to Free Rodney Reed will hold an all-night, candlelit vigil in front of the UT Tower on the Main Mall to raise awareness about Rodney’s case and other prisoners being held on Texas’ Death Row. Senior Collin Poirot, an organizer for the event, says, “This vigil is intended as a way to show solidarity with Rodney, his family, and his community. We will begin the evening with comments from community members who have been involved with Rodney’s case since the beginning, and will be holding other events over the course of the vigil.” The vigil will last from 9:00 PM to 7:00 AM. Although Governor Abbott and the Board of Pardons and Paroles remained silent with regard to Reed’s case, the Texas Court of Criminal Appeals (CCA) decided on Monday February 22nd to grant Mr. Reed a temporary stay until a further evidenciary hearing could be conducted. This decision by the CCA comes in response to an appeal by Rodney’s attorneys, submitted on February 13th, wherein the attorneys present three new affidavits by highly esteemed medical examiners, each testifying that the medical evidence in the case wholly contradicts the timeline provided by the prosecution in Rodney’s initial sentencing. Although initially silent with regard to the case, Gov. Abbott finally spoke about Rodney’s situation in a press conference following the CCA decision. The all-night vigil is partly a response to Gov. Abbott’s statement, insofar as the governor has yet to acknowledge that, even if Rodney is eventually exonerated, he will still have spent 18 years on death row. Rodney’s family deserves reparations from the state, along with a public apology and an official acknowledgment that the Texas criminal justice system stole 18 years of this innocent man’s life. The fact that Rodney was judged by an all-white jury is further evidence that the criminal justice system in Texas is deeply flawed and prone to horrific miscarriages of justice. The first step in making this right for Rodney and his family is give him a speedy and transparent trial. That is what participants in this vigil are asking for, and they will accept nothing less. The candlelight vigil follows in the wake of a series of awareness-raising events held on the UT campus and around Austin over the past month. On Friday February 6th, students held a phone banking event and organized a community-wide call-in to Gov. Abbott’s “Opinion Hotline” and the offices of various members of the Board of Pardons and Paroles. On Monday February 16th, students organized an educational flash mob to raise awareness among students. There have also been multiple screenings of the documentary “State vs. Reed” on campus and around Austin, and there have been two large-scale public demonstrations regarding Rodney’s case, first on Valentine’s Day and then again on Saturday February 21st. The latter rally attracted more than two hundred people from all over the state, who came to show solidarity with the Reed family and demand a full review of Rodney’s case, additional DNA testing, and a new trial. This entry was posted in Protest and tagged Amnesty International, candlelight vigil, Justice4Rodney, University of Texas on February 25, 2015 by justice4rodneyreed. Its disgusting that this man has been sitting in prison and is possibly innocent. The only thing standing between him and being “free” is a simple DNA test….? ?